I love a good salad as much as the next gal, but sometimes they just aren’t filling enough. Have you ever eaten a giant salad packed with all the veggies, then an hour later your stomach is growling? 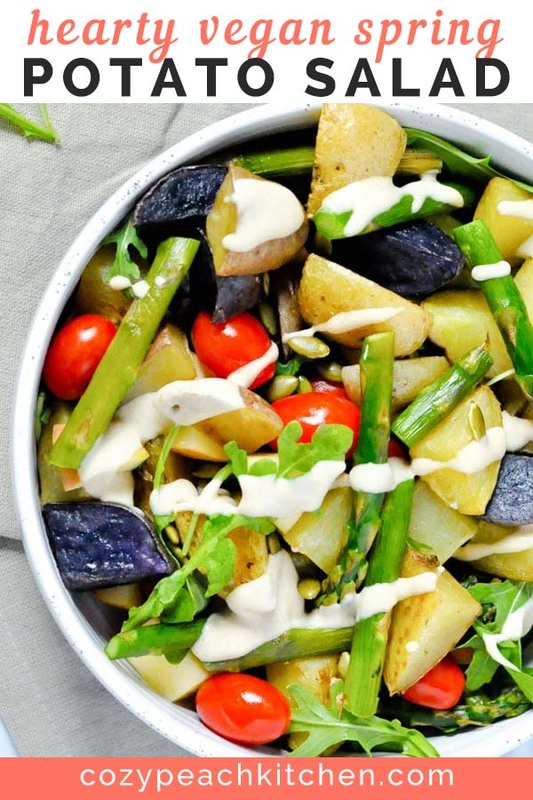 That’s where this hearty spring potato salad comes in to play. It’s nutrient dense, filling, and 100% plant-based. The perfect salad isn’t just vegetables. 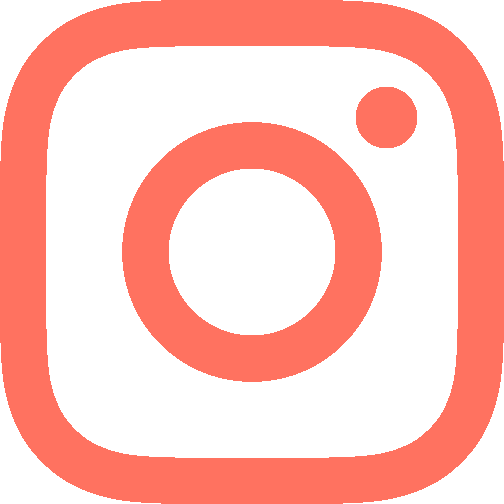 It’s fruit, veggies, legumes, and healthy fats. Because when you combine a variety of nutrient-dense plant foods, especially those high in fiber and healthy fats, you’re bound to stay full until the next meal. Roasted baby potatoes: Baby potatoes are just as good as mama potatoes (sorry not sorry), they’re just a little smaller and usually a bit sweeter. 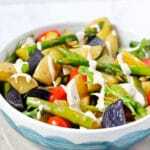 And sometimes they come in fun colors, like the white, brown, and purple potatoes I used for this salad. They’re full of nutrients (iron, B vitamins, potassium), and if you leave the skin on (as I did in this recipe) you’re getting an extra oomph of fiber and nutrients. Which, in my book, is a plus. Asparagus: Did you know you have to wait two years to harvest asparagus after planting it? I can only hope that some day I stay in the same house longer than a year so that I can plant some asparagus. It’s pretty much the definition of a hearty spring veggie! Cherry tomatoes: Is there anything better than a ripe, juicy tomato? That umami, those antioxidants…mmm! Toasted pumpkin seeds: Healthy fats, protein, and jam packed with fiber. A great source of satiety. 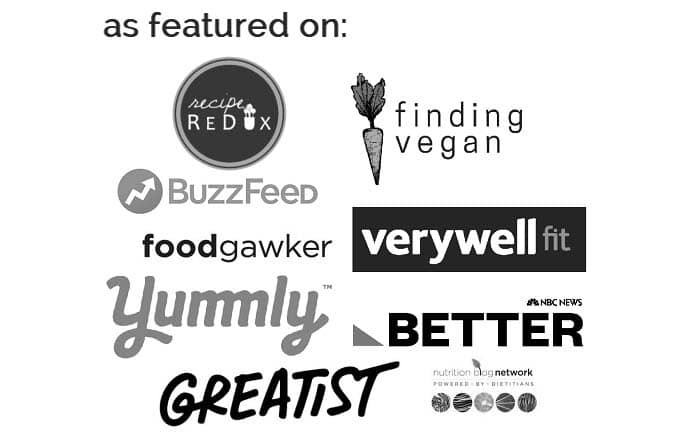 Green lentils: I think if there had to be a definition for heart plant-based protein, it would be green lentils. Every good salad needs a good source of protein, and these lentils are sure to be just the protein you’re looking for. Arugula: No salad is complete without a hearty green. Arugula is slightly spicy and entirely delicious. Enough said. Apple: Because every good salad deserves a sweet, crispy crunch. 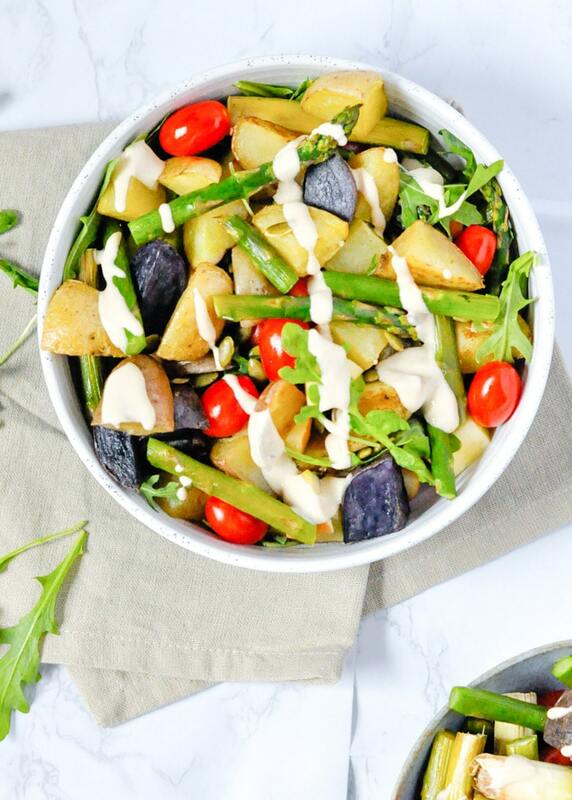 Instead of traditional heavy mayo-based dressing that’s usually found in potato salads, this dressing calls for just two ingredients: tahini and lemon. 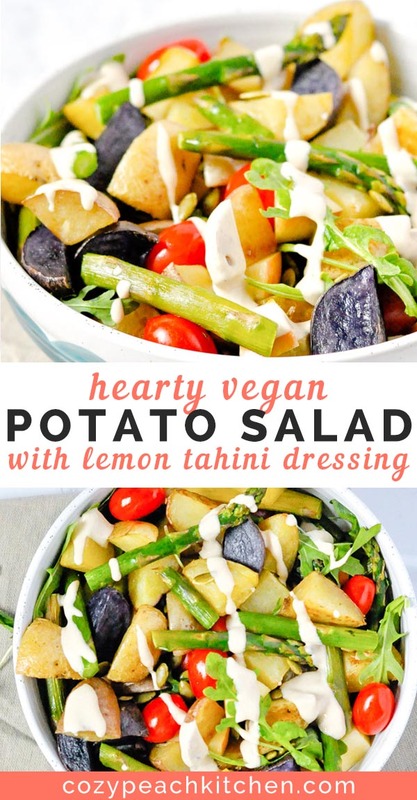 Lemon and tahini make a light, bright, and 100% vegan potato salad dressing. I promise you won’t even notice the mayo is missing! To make, just mix together 1/4 cup tahini and the juice from one large lemon. Add water to thin to desired consistency. Use on this potato salad or on a variety of leafy greens, like this warm kale salad. 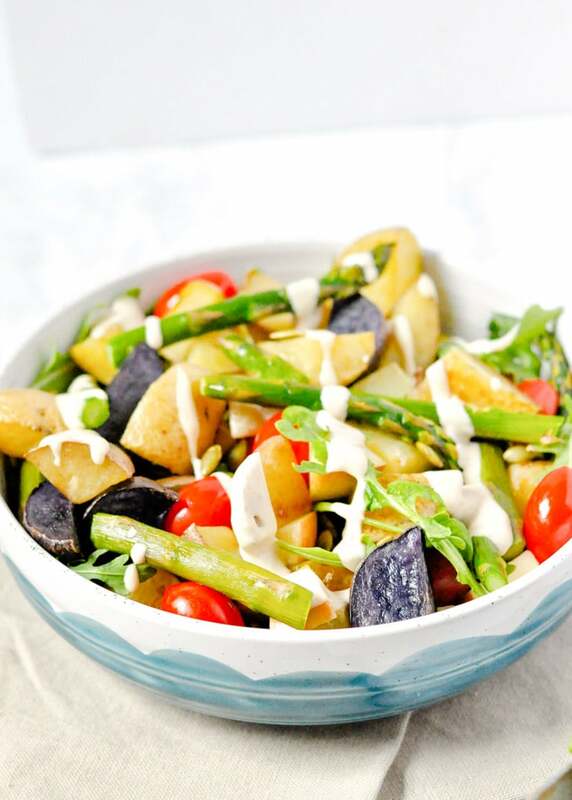 Enjoy this vegan potato salad as a light lunch recipe or served as a side at a picnic. 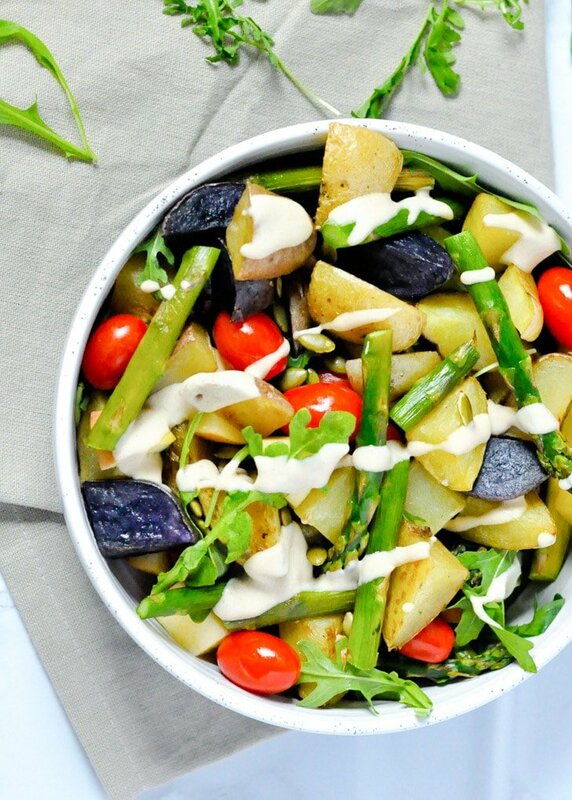 This vegan potato salad is made with seasonal spring ingredients like asparagus and baby potatoes. It's drizzled with an easy, flavorful lemon tahini dressing. Preheat oven to 425 degrees F. Rinse and sort lentils. Combine lentils and vegetable broth in a medium saucepan. Bring to a boil for one minute. Reduce to a gentle simmer. Simmer the lentils uncovered for 20 minutes, keeping the lentils covered in ~1 inch of liquid while simmering. While lentils are cooking, prepare your potatoes by cutting them in quarters. In a medium bowl, toss in 1-2 teaspoons of olive oil, salt, and pepper. Roast on a parchment paper lined sheet pan in preheated oven for 25 minutes, until browned. Drizzle asparagus with remaining olive oil. Add asparagus and pepitas to the sheet pan with the potatoes during the last 10 minutes of the potato cook time. Roast for about 10 minutes. Everything should be done roasting at the same time (total of 25 minutes for the potatoes, 10 minutes for asparagus and pepitas). Combine potatoes, asparagus, fresh cherry tomatoes, arugula, pepitas, drained lentils and apple in a larege salad bowl. 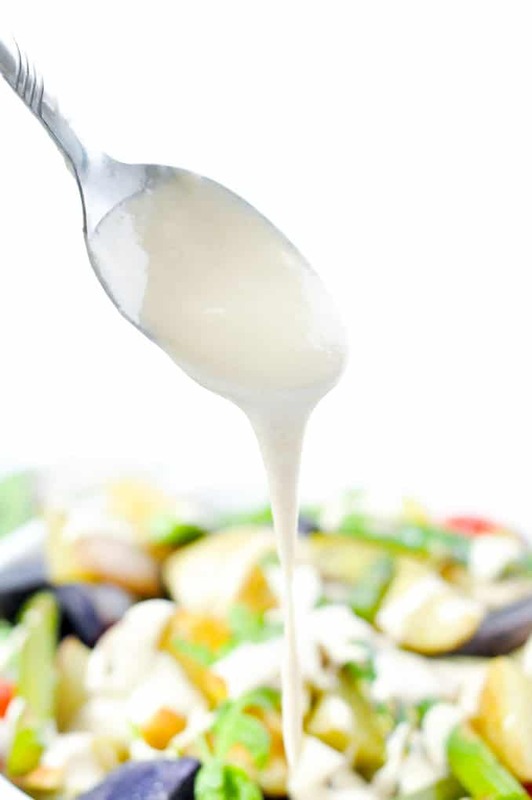 Mix lemon juice and tahini together in a small bowl. Toss the salad in lemon tahini dressing and refrigerate until completely cooled (about 3 hours). Serve when cool. *Quick tip on how to remove asparagus ends without a knife.